Sergey Kasich is the first recipient of the joint "Garage/BMW : Art/Tech Grant" program by BMW Group Russia and Garage Museum of Contemporary Art which was announced this Tuesday. The grant program is aimed at supporting individual and collective art projects in the field of IT, engineering and science art. Over the period of one year, Kasich will receive a monthly scholarship and will be able to implement his art project "Spaces of Silence". The artist will also be able to consult with BMW designers and engineers and visit BMW Museum and other relevant locations. Sergey Kasich's project "Spaces of Silence"
Every year, the acoustic environment of modern cities is becoming noisier. It is proven that overabundance of auditory stimuli can adversely affect the wellbeing of living beings. Kasich proposes to preserve silence with the help of a hybrid public art project. The project involves measuring the noise level in a city, the detection of noisy and quiet areas and the creation of special structures in selected locations made of noise-absorbing screens with echo surfaces on the inside. Spaces are protected from noise while leaving them as open as possible creating unique environments to experience sound in unexpected ways. With this partnership, the BMW Group aims at making art and culture more accessible and supporting contemporary art in Russia. 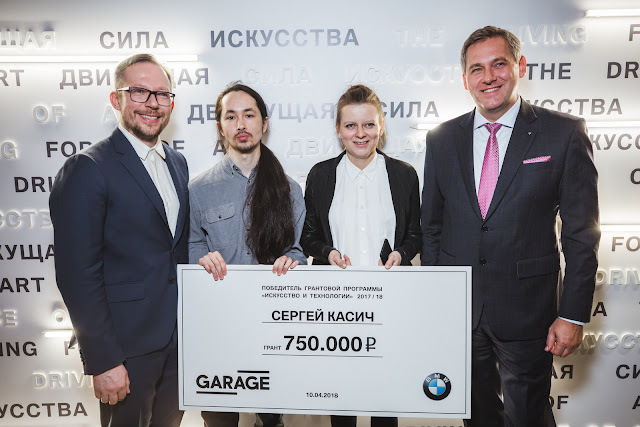 BMW Group Russia concentrates its efforts mainly on the recently included Art and Technology section - the Art/Tech Grant offers emerging artists financial independence and allows them to engage in creative activities, to grow professionally and to conduct research.